This Pumpkin Casserole is a great way to put a veggie-filled dish on the table. It’s so creamy and tasty that no one will even realize how healthy it is! Holidays can be very difficult for vegans because most festivities revolve around food. I used to be teased about the plant-based food that I brought to the table…but I never let it get me down! The good news is that my family members who decide to try my dish really like the food I bring (they really love my Lentil Puff Pastry Pockets and Creamy Cauliflower Mashed Potatoes with Shiitake Mushroom Gravy on Thanksgiving). Over time family and friends have become more accepting and curious about my creations which makes the food less intimidating to others. Lately, more and more people are really interested in trying all of my food. They ask questions and have loved so many of my recipes. This year I wanted to step up my game and bring some extra tasty recipes that I have created myself to impress the family. Today I’m sharing a dish that I think everyone will really enjoy – my Pumpkin Casserole with veggies. 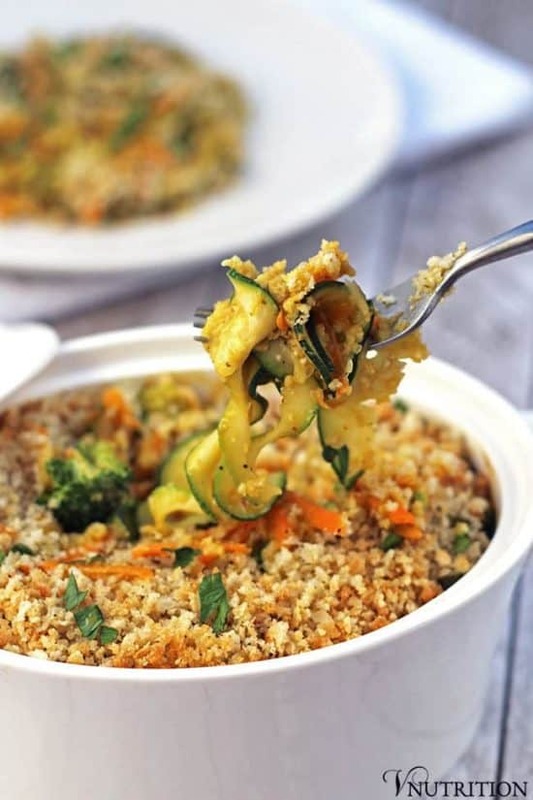 This pumpkin casserole is so easy to make especially if you use a vegetable spiralizer or mandolin to cut up the veggies – those are two of my must have plant-based tools that save me hours of chopping frustrations in the kitchen. And because so many people loved my Pumpkin Pasta sauce I thought I’d use it as a base for the pumpkin casserole! The creaminess of the sauce and all round tastiness will make anyone forget that this dish is vegan (and healthy). 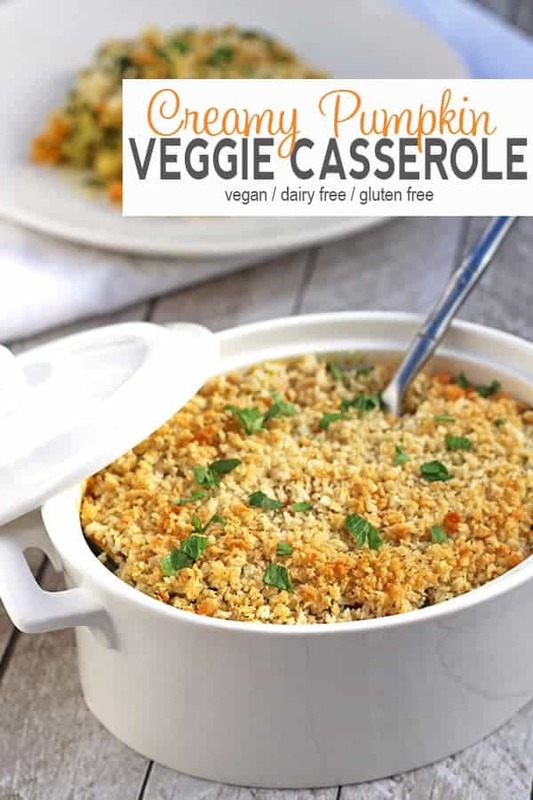 Adding the breadcrumbs really tops it off well and adds that little crunch needed for any good veggie casserole. Like I said in my pumpkin pasta post, the sauce is loaded with beta-carotene from the pumpkin! Beta-carotene can be converted to Vitamin A in our bodies which aids in vision health as well as a healthy immune system. 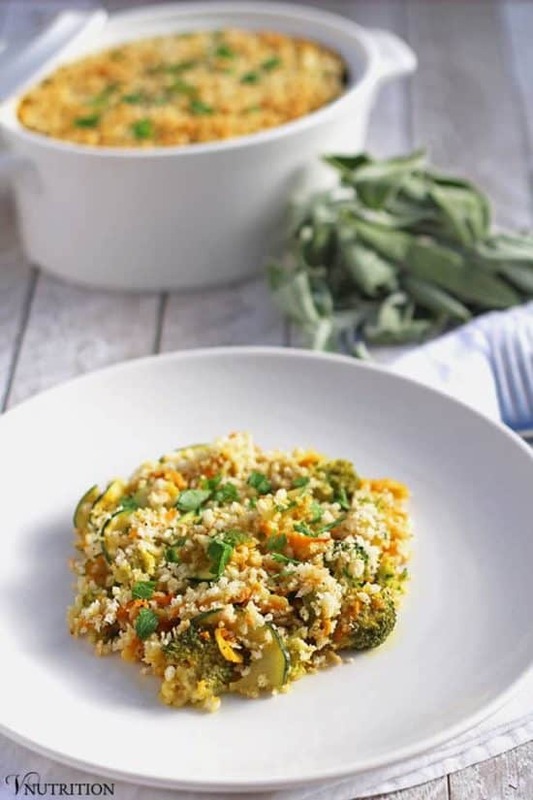 Add in those veggies and you add fiber and lots of other vitamins like vitamin C from the broccoli and zucchini and even more beta carotene from the carrots! This Pumpkin Vegetable Casserole is a great way to put a veggie-filled dish on the table. And it's so tasty that no one will even realize how healthy it is! Heat olive oil in pan. Add onions and cook about 3-5 minutes. In a bowl, mix pumpkin sauce with milk. Add pumpkin sauce mixture, onions, and vegetables to a baking dish. 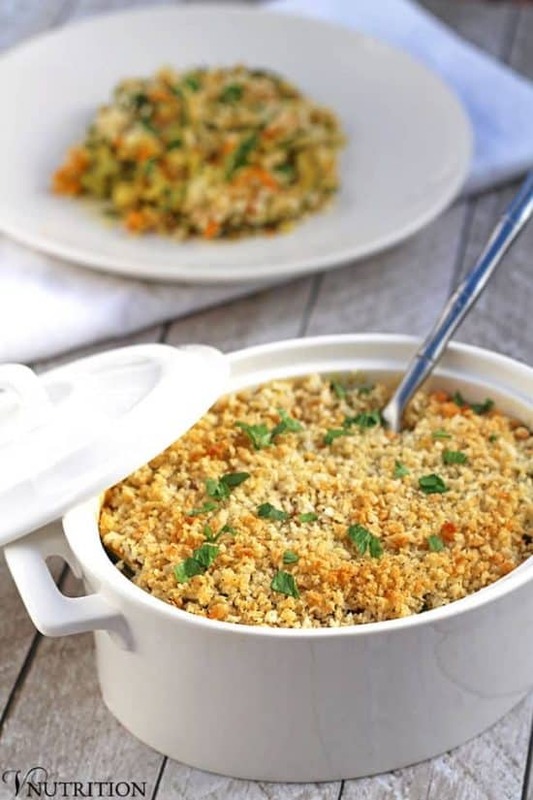 In a separate bowl, mix together breadcrumbs, olive oil, salt, pepper and parmesan cheese (if using) and sprinkle on top of the vegetable mixture. Easy make ahead tip: you can enjoy some of my pumpkin pasta a night or two before and save half the sauce for this pumpkin vegetable bake. 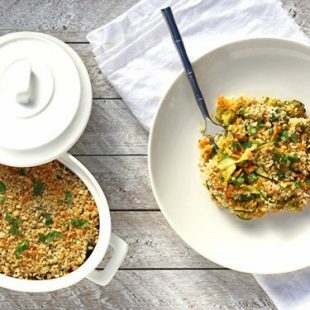 Two easy dishes in one for the week! This looks like the perfect side dish for Thanksgiving! I’d love to have these on the Thanksgiving table. Yum! Thanks Jenn! Yes, I will eat any veggies with a crispy topping! so, this is a vegan dish, but i can’t seem to find a vegan pumpkin sauce!! can i use canned pumpkin instead?? I would love that sort of bake at any celebration dinner – those spiralised zucchnis look great. How could they not like your food?? It sounds awesome! This dish is gorgeous! Looking forward to your main dish recipe! Kimmy, Matt and I actually decorate for Christmas the day after Thanksgiving (because we both always have off that day) so maybe we’re even pushing it a little too lol. But to have decorations up already, let’s get real! Thanks so much Kimmy, I hope everyone really likes it! I need to do that more too…but so many people know I’m vegan they’re always suspicious! Thanks so much Julie! This looks delicious and I love that you use zoodles instead of regular noodles in a bake like this! 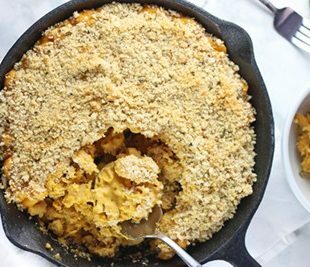 My favorite part of Thanksgiving is the side dishes and this looks perfect– I can’t wait to try it! Thank you Courtney! Side dishes are my favorite too! Agreed, Thanksgiving is all about the side dishes and this looks great. Thanks! Thank you Annmarie! Let me know what you think! Looks delicious and perfect for the holidays! What a fantastic side dish, It is like nothing I have ever had and sounds delicious! Oh I love all the photos of this 🙂 We don’t have thanksgiving over here but I think I still have to make this! 😛 It looks and sounds so very tasty 😀 Thanks so much for sharing… looking forward to see what else you have planned! Yum! I love to non traditional spin on Thanksgiving! I’m a sucker for mashed potatoes myself—those are my fave! Yes, mashed potatoes are actually my favorite too. I was never much of a meat eater even before going veg so my Thanksgiving plate was always piled high with mashed potatoes! This looks insanely good! I love that it’s healthy, yet satisfying and comforting. This would make a perfect side dish for the holiday. It would be the talk of the table. Gorgeous photos, too! Thank you so much Melissa! That is so sweet of you! This looks wonderful! Can I have the nutritional information for it? I’m sorry but right now I’m not doing nutritional info for my recipes as I just don’t have the time. Recipe testing, writing, photography and publishing takes so many hours a week that it is too just too hard for me to fit in doing the nutritional information as well – at least for now. You can check nutritional information with the My Fitness Pal online tool. You can add the ingredients and it will give you a list of your nutrients for any meal. I really hope you enjoy the vegetable bake! Looks amazing, Mary Ellen! I love your recipes. This is a great idea. I don’t know why I never thought about using the pasta sauces for veggie bakes. Pumpkin sauce link doesn’t work. Takes you to the vegan Parmesan recipe. Hi Mary, this looks absolutely delicious and I’m going to try it out tonight. One question – how many people does this serve? I couldn’t find it in the recipe. Thanks! Hi Jade! Sorry about that, I didn’t realize I didn’t have the servings on there! It should serve about 4 as a side dish. This is the perfect fall dish. I modified it by adding Basmati rice and roasted chickpeas to make it a complete meal. My entire family loved it and my husband said it is the best meal he’s had in a long time. All of the recipes on this site have been a hit with my entire family and pleasing a 6 year old and a 5 year old is not always easy. I’m so glad the family enjoyed the recipe Annemarie! 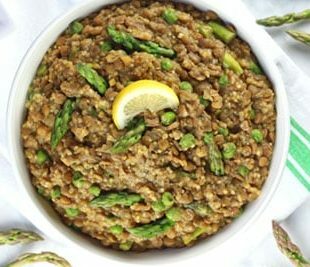 I love the addition of the chickpeas and rice for a full meal! I am making this for a dinner tomorrow. Can I put together and cook tomorrow? Thanks! I’m so sorry I’m just seeing this Emily. I was traveling this week. I’ve never tried putting it together beforehand but I have made the sauce the day before and it came out tasty. Hi Stacy. I’ve actually never frozen and reheated this before. I usually eat the leftovers for lunch during the week so I haven’t had the opportunity. I would *think* it would be okay. You may need to add a little extra broth to it when reheating. Every time I head up something with cashew cream, it needs a little more liquid to get to that back to that full creamy consistency. If you do try it, let me know how it goes! Hi. 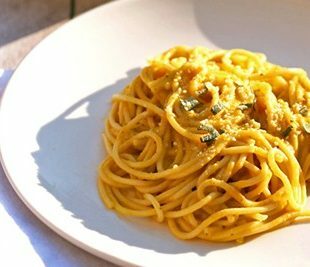 Is it possible to replace the pumpkin sauce with anything? Hi Katya, I’ve never tried the recipe with anything but the pumpkin sauce. Maybe some kind of creamy type soup or other creamy sauce could work as a replacement. If you do try something that works definitely let me know! 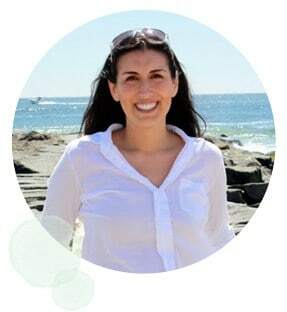 My daughter is vegan along with gluten and soy allergies. We had a family party to attend and she usually has to eat before parties or just eat a salad. I made your pumpkin sauce and your pumpkin casserole with vegetables to take along. The only change I made was I used butternut squash instead of pumpkin and it was delicious! Everyone enjoyed it, went back for seconds and asked for the recipe! Thank you! Next on my list to try is your Buffalo Cauliflower Mac and Cheese! Hi Jackie! I’m so glad everyone enjoyed it and that your daughter had something to eat at the party. 🙂 I’ll have to try the butternut squash in there too! I hope you enjoy the buffalo mac and cheese as well if you get to give it a try!